One of the most well-known and perhaps the most famous disciples of Raghavendra Swamy is Appannacharya. Appannacharya was to Raghavendra what Purandara was to Vyasa Raja in his earlier avatar. It was Appannacharya who drew upon Rayaru’s vast knowledge and taught the many hundreds of students who thronged his Gurukula at Bichale. The Gurukula had no building but it was an open place at the Japada Katte. The students went around the small village of Bichale and collected alms. During his lifetime, Appannacharya composed many slokas in praise of Raghavendra Swamy. All these slokas were originally in Sanskrit. Not many know that most of the Sanskrit hymns that we chant today in honor of Rayaru such as the Raghavendra stotra, mangalashtaka, dandaka are all compositions by Appannacharya. The most famous composition of all is Poojaya Raghavendraiah Satyadharma……. Which is a part of the Poornabodha Sloka that Appanacharya composed when he waded across the raging Tungabhadra on hearing that Rayaru was about to enter Brindavana. Though Rayaru wanted to give Sanyasa to Appannacharya and make him the next head of the Matha, Appannacharya refused. There was a simple reason for this. Appannacharya was addicted to chewing tobacco and he could never get out of this habit. Though Rayaru had advised him many times to give up this habit, Appannacharya always laughingly told him he had become a slave to this. He thus did not become the next head of the Matha. However, his devotion to Rayaru was unquestionable. Though he was two years older to Rayaru, he gave himself up totally to ensure that Rayaru did not face any problem during his stay in Bichale. When Rayaru first set foot in the house of Appannacharya, he realised that Appannacharya and his first wife did not have any children. Rayaru himself forced Appannacharya to marry a second time and this time the couple had children. The descendents of this lineage continues till today and one of them looks after the Japada Katte while the other looks after the house that is in ruins. Today nothing remains of the old Bichale village. The entire village was swept away in the flash floods that drowned Mantralaya and other surrounding areas in October 2009. A new Bichale has come up atop a small hillock. Even today, we can see broken down homes and destroyed temples in the old village. Miraculously, there was no harm to the Eka shila Brindavana on the Japada Katte. However, the main branch of the Gum tree where Appannacharya used to keep rice tied to a branch of the tree was washed away by the flood waters. Today, only a small tree of the old behemoth remains. The river water even now inundates the Brindavana every year but only for a few days. The flash floods of 2009 are only a memory but they are a painful reminder of Nature’s fury. There is however, not much damage to the Japada Katte. Apart from the Brindavana, the other structures too exists. Thus the legend of Appannacharya and Raghavendra Swamy lives on. Bichale or Bhikshalaya is one of the most holiest places associated with Raghavendra Swamy. This can be called the third Mantralaya. The credit for being called the second Mantralaya goes to Honalli. Coming back to Bhikshalaya, this is very the place where our beloved Rayaru spent 12 years of his life, staying in the house of Appanacharya, an educationist and religious teacher of the 17th century. Raghavendra Swamy had heard about Bichale and Appanacharya and so he came down here from Adoni. He was given a warm and affectionate welcome by Appancaharya. The bond between the two men was so great that Rayaru consented to stay on here. Appancharya, though two years elder to Rayaru, spent the next 12 years in service of Rayaru. He lovingly fed Rayaru and ground the Kadale Kale on the grinding stone himself. He sat with Rayaru on the Japada Katte here and both of them spent hours, days and months discussing a variety of issues related to the Shastras, Puranas, Upanishats. Till 2009, one could see the old house where Rayaru spent his days. The place where he slept, the place where he did Moola Rama pooje were all marked. The Hutta or anthill where the snake resided was also marked. However, the devastating floods of 2009 wiped away many of these places. Indeed, it completely brought down the house. Today, the outer walls of the house have been rebuilt. The inner portion is expected to be completed shortly, says the sixth generation descendent of Appancahcrya. The two-room house is now in shambles and a row of aarti cups demote the place where Rayaru used to sleep. The house is significant for several reasons. The first is or rather was because of its heritage value. The structure belonged to the 17th century and it had not undergone many alterations or changes. This would give us an insight on how people lived in those days. Secondly, Rayaru, came to Bichale, sometime in 1658-59 and stayed on here till 1671. This is a simple two-room house, typical of structures in north Karnataka. The house was near the Tungabhadra and Rayaru and Appanacharya walked from there to the Japada Katte where they spent hours discussing religion, theology and philosophy. It is in this house that Rayaru formulated his ideas about Chandrika and wrote them on the Japada Katte. This work called Tatparya Chandrika was the last work of Raghavendr Swamy. Incidnetally, the original work of Chandrika was by Vyasa Raja, the previous avatar of Raghavendra Swamy. Thus Bichale is holy in many ways. It is from here that Rayaru decided to enter Brindavana. His last work came to be written here. More than anything else, many of the hymns to Raghavendra including “Poojyaya Raghavendraiah …..””came to be formulate here by Appanacharya. There are hundreds of Mrithike Brindavana of Raghavendra Swamy but there is only one Eka Shika Brindavana and that is in Bichale or Bhikshalaya, which is a small hamlet in Raichur district in Karnataka. Bichale is just 14 kms from Mantralaya and lies on the other banks of the Tungabhadra. It is best approached by road and if you happened to visit Mantralaya, take a trip to Bichale and Gandhal where the temple of Panchamukhi Hanuman is situated. Both Bichale and Gandhal are close to Raghavendra Swamy and he spent years here. The Brindavana in Bichale is the first such structure to come up after Mantralaya. If Dewan Venkanna and the Nawab of Adoni, Siddi Masud Khan, built the Brindavana in Mantralaya, it was Rayaru’s favourite Sishya, Appanacharya, who personally built this Brindavana. Unlike other Brindavanas, Rayaru himself came in a dream to Appanacharya and asked him to build the Brindavana. The story of the Brindavana is as follows. 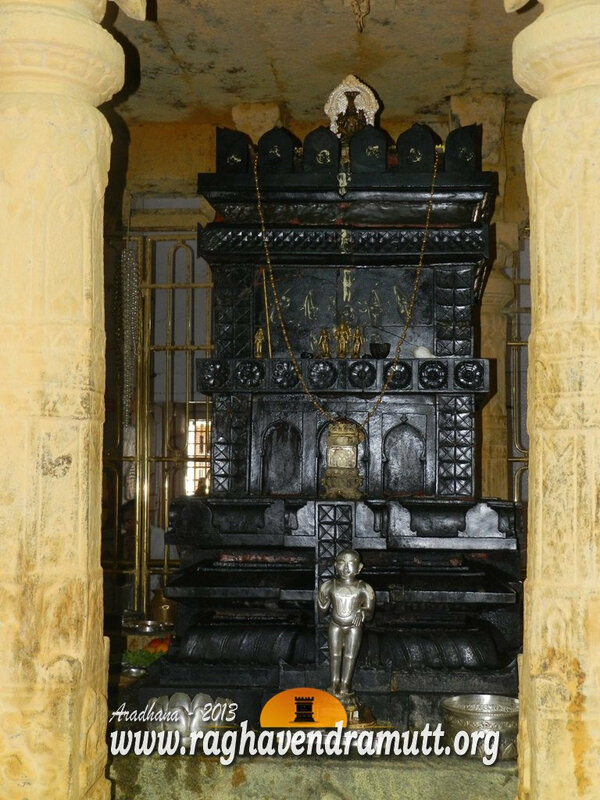 Rayaru entered Brindavana in Mantralaya in 1671. Appanacharya was not there and when he managed to rush back, he found that his beloved Guru had already entered Brindavana. From the day Raghavendra Swamy entered Brindavana, Appanacharaya used to visit Mantralaya regularly. Not a day went without Appanacharya either swimming across the Tungabhadra or walking to Mantralaya from Bichale where he lived. Every day that Appanacharya lived was reminder to him about the tome he spent with Rayaru. He was just as faithful and devoted to Rayaru after he entered Brindavana as he was when they both lived in Bichale. Appanacharya was ageing but the years did not dim his devotion and respect to Rayaru. Days turned into weeks and weeks into months and there was no sign of Appanacharya giving up his daily ritual-going to mantralaya and seeing the Brindavana and reliving the times he and Rayaru spent. Appanacharya then personally monitored the construction of the Brindavana. Today, it is the only Ekashika Brindavana of Raghavendra Swamy. The Brindavana earlier was open to the skies. There was no roof over it. However, recently a small canopy has been installed. Regular poojas and seves are conducted here. The Brindavana is also the first to be built outside Mantralaya. This could also perhaps be the only Brindavana of Raghavendra Swamy without a matha surrounding it. The Brindavana is on the banks of the Tungabhadra. But beware, The river here is free flowing and is deep in many places. It is better not to go swimming. Keep children away from the river front. By the way, take care not to go near the many monkeys that have been wrecking havoc in the area. These monkeys attack people and they desecrate the place. You can contact the descendents of Appanacharya for any further information. They make arrangements for Theertha Prasad if you give them prior information.